The RAM YORK cross tube series is composed of a high quality welded cylinder utilizing a strong forged steel cross tube base along with a welded rod cross tube with grease zerks; and optionally a RAM York Clevis Series that utilizes a strong forged steel base. The rod clevis is threaded on with a clamping locking bolt that prevents thread damage. Designed for performance, all YORK cylinders contain a heavy-duty piston and piston stem. The internally threaded gland reduces the cross section and is easily removed for maintenance. YORK cylinder line is perfect for construction, agricultural and general use applications. 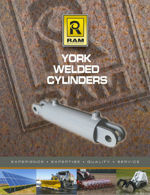 RAM York Cross Tube Series is available with bore sizes starting at 1 ½" to 8" with strokes starting at 4" up to 60". 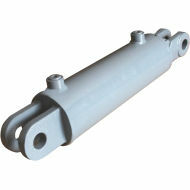 RAM York Clevis Series is available with bore sizes starting at 2" to 4" with strokes of 4" up to 48". Standard black paint, custom colours available.